The aim of this lab exercise is to experimentally create the Current vs. Voltage for an actual solar cell under various illumination conditions. 17 V (Nominal) Thin Film Amorphous Silicon Solar Module, Four 100 W Halogen lamps, small electronic circuits to control load voltage of solar panel, standard Data Acquisition Equipment interfaced to a computer. The sun radiates energy at a rate of 3.9 x 1026 Watts. At the top of the earth’s atmosphere, an average power of 1353 Wattsm-2 is received. At the surface, near the earth’s equator, 1000 Wattsm-2 is typical when the sun is directly overhead. 1000 Wattsm-2 is typically defined as the “Standard Solar Irradiation”. It is defined as, when the light incident on the solar panel is perpendicular to the solar panel. 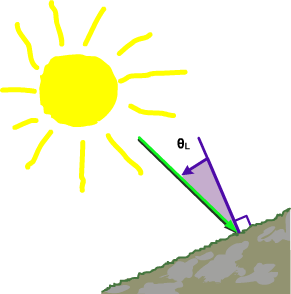 As the sun moves away from being directly overhead, the density of the sunlight at the surface decreases and the power output of the cells decreases relative to the cosine of the incident angle, θL, as shown in the figure below. Other factors, such as seasonal variations in the latitude of the sun, also affect solar irradiation. Good solar sites usually have greater than 2500 KWhm-2 of power available per year. This is the total sunlight power that a square meter of land will receive in one year. Dividing this number by 365 yields about 6.8 KWhm-2 of power per day.The above data shows that there is significant power available in solar energy. The difficulty lies in converting it efficiently and cheaply. Photovoltaic solar cells are one of the most common ways of doing this. In the Czochralski process a silicon ingot is “grown” or drawn from a pool of molten silicon. This entire ingot forms one single crystal, yielding mono-crystalline silicon solar cells. The ingot is cut into wafer thin slices. The slices are then “doped”. One side is doped to be positive – the P side. Small amounts of an impurity, such as Boron, are added which creates an excess of “holes”. The other side is doped to be negative – the N side. A different impurity, such as Phosphorus, is added which creates an excess of electrons. The band gap voltage (energy potential difference) created by the silicon P-N junction is around 0.5 V per cell as a result. In polycrystalline silicon cells, silicon is melted and poured into blocks, which are then cut into wafers. This process introduces many crystals within a single cell. The boundaries between the different crystals reduce the efficiency of the cell. However, this process has a lower cost of manufacturing. On the other hand, thin film, or amorphous solar cells are made by depositing a thin-film of the solar cell material onto a substrate (typically glass) and then doping the film. Because this method uses much smaller amounts of raw materials and often employs common semiconductor vapour deposition processes, it is the cheapest and simplest method. However, the efficiency of the cells is usually less. Cells can also be layered on top of each other, creating a heterojunction cell. The different layers are often responsive to different frequencies of light. Thus, the overall efficiency of the cell can be increased. Numerous cell chemistries exist, such as Doped Silicon, Cadmium-Telluride and Gallium-Arsenide. Each provides a slightly different type of P-N junction, which may have different band-gaps and respond to different frequencies of light. Sunlight hits the solar cell – if the energy of the photon is high enough (≥band gap energy), it is absorbed on the P-side. This sends the “holes” towards the N-side. A potential difference (voltage) is thereby created across the p-n junction that drives the current and propels the excess free electrons to the conductor on the top of the cell. A solar cell is essentially a diode with a large area. It can therefore be described simplistically by the following equivalent circuit. Where ID is the current across the diode D, and IPh is the photocurrent generated by the current source. Where IS is the saturation current, VD is the cell voltage, VT is the thermal voltage, and m is the diode factor. This then yields the following formula, which describes the circuit shown in Figure 4 above. A common values for VT at a temperature of 25° C is VT = 25.7 mV. The saturation current IS typically in the order of 10-10 to 10-5 Amps. For an ideal diode, the diode factor m is equal to 1. 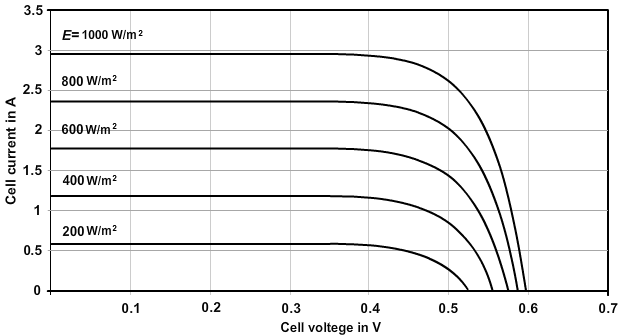 Using a diode factor between the values 1 and 5 may give a more accurate description of the solar cell characteristics. The following set of curves describing the relationship between the current I, and the voltage VD, is obtained by using the above common values and Equation 1. These curves are actually a subset of an infinite number of curves which satisfy the previous equation. Each curve represents a different level of Irradiance, which is measured in Wattsm-2. An example of the influence of solar irradiation on a solar cell is given below. In essence, a photovoltaic solar cell will produce current depending on the load attached to it. For example, the short-circuit photocurrent can be found by substituting VD = 0 into the comprehensive Equation 1 developed above. On the plot above and from the equations, we can see that the photocurrent is greatest under short circuit conditions. The open-circuit voltage VOC, is the voltage when the positive and negative leads of the cell are not connected to any kind of circuit. At this point, naturally, the current will be zero. This condition is satisfied by the points lying on the x-axis (Voltage) of the plot. The following diagram shows these points. 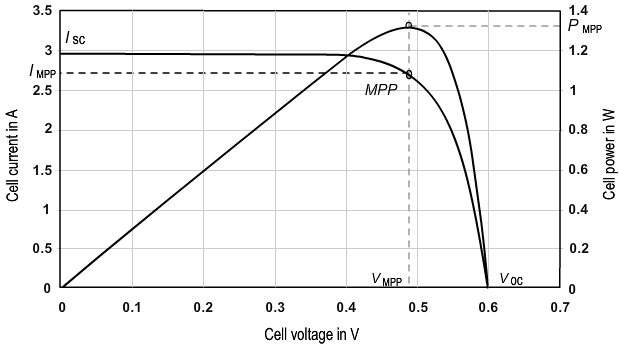 The power of the cell can be obtained by multiplying the cell’s voltage and current, for any particular operating point on the Current-Voltage (I-V) curve. A unique fact of photovoltaic solar cells is that the power output of the cell can be adjusted by changing the load voltage. By adjusting the load voltage, the cell’s current output can also be adjusted. Since power is the multiplication of voltage and current, the power output of the cell can also be modified by adjusting the load voltage. The point at which the power is optimized is called the Maximum Power Point (MPP). Note that the maximum power is usually not at the same point as either the maximum voltage or current. A Maximum Power Point Tracker (MPPT) is an electronic DC-DC converter which adjusts the load voltage on a cell to optimize the power output. Typically, power gains of 10-15% can be realized, for the same input solar irradiation. This implies that the efficiency of the cell is improved by operating the cell at the MPP. The equivalent circuit and resulting equations can be modified with increasing complexity to more accurately describe the output of the solar cells under various changing conditions. In particular, models have been developed to account for variations in temperature, series resistance and parallel resistance, as well as operation in negative voltage and extreme positive voltage regions. These models are not covered here, but you are encouraged to refer to the Reference  for more information. Solar Cells can be electrically connected together exactly the same way as batteries. 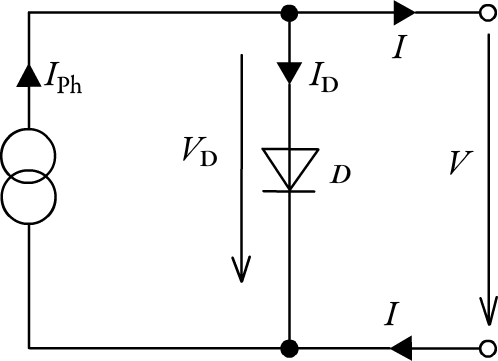 Currents add when connected in parallel and stay the same when connected in series, while voltages add when connected in series and stay the same when connected in parallel. Modules of cells can be added together in the same fashion. 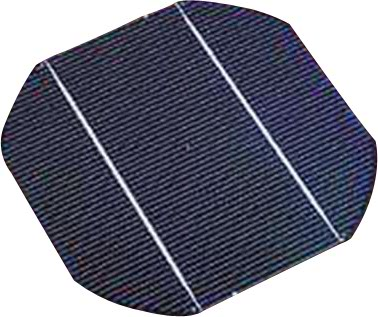 Individual solar cells are connected together in series to form a solar panel. The P side of one cell is connected to the N side of the next cell, and so on. As mentioned above, voltages add together to form higher voltages. Current stays the same for the whole panel as for one single cell. Individual solar panels are connected in parallel to form a solar array. The voltage stays the same for the whole array as for the individual panels. The currents from the individual panels add together to form higher currents.